From this Chatelaine story find out the perfect bike workout for you. Fresh air, low cost, low impact: what’s not to love about cycling? Whether you’re a beginner or a pro at pedalling, choose a step-by-step workout to get you started this season and keep you cycling smoothly. Warm up with an easy 10-minute cycle until you’re sweating lightly. Ride on routes that are flat. As you get comfortable, climb a few hills. Practise shifting gears; find one that’s comfortable for riding uphill. 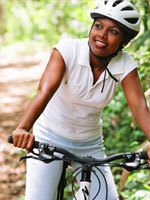 Gradually increase your rides from 10 to 20 and then 30 minutes, three times a week. TIP If you focus on an obstacle on the road ahead, such as a rock or parked car, you’re more likely to run into it, says Maria Mountain, a kinesiologist at the Fowler Kennedy Sport Medicine Clinic in London, Ont. Keep your eyes focused on where you want to go—not on what you want to avoid. Warm up with an easy 10-minute ride. Do cycling intervals. Bike for two minutes at a quicker pace, then pedal for four minutes at an easier pace. Alternate from hard to easy four times. Bike for 20 to 60 minutes, three to five times a week. Increase your cycling time by two to three minutes every two weeks. TIP Stay in gears that allow 90 to 100 revolutions per minute (rpm) or 22 to 25 revolutions per 15 seconds when on flat terraine, says Lesley Tomlinson, two-time mountain bike Olympian. This faster pace prevents your knees from getting sore. A bike computer will help you track rpm. Warm up with an easy 10-minute cycle. Do high-intensity cycling intervals. Cycle for three minutes at a faster pace, but not a sprint. Further increase your speed for two to four minutes. Your legs will be burning and you should feel tired but able to continue. Slow it down to an easy pace for three to six minutes. Repeat three to five times. Lift weights two to three times a week to build muscle. The stronger you are, the more force you can put into pedalling and the faster you’ll go. Cycle for 60 minutes, four to five times a week, alternating long rides with interval training or hills. TIP Shift to an easier gear when you’re approaching a hill, says mountain biker Lesley Tomlinson. When you’re halfway up and half-exhausted, it’s harder on your legs and the bike to make a major gear shift.